All eligible pregnant women in England are offered screening for Down’s, Edwards’ and Patau’s syndromes. Staff must fully complete the laboratory request form with the correct information to enable the screening laboratory to process the sample without delay and to report an accurate result. Completion of the laboratory request form is a key performance indicator (KPI). 62% of maternity providers across England meet the acceptable threshold of 97% and 1.4% meet the achievable threshold (national KPI data Q2 2015 to 2016). 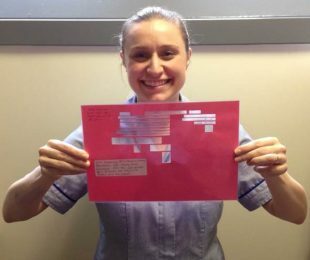 Charlotte Louise Daniels, the Derby Teaching Hospitals NHS Foundation Trust interim antenatal screening coordinator, took action because the trust had never achieved the acceptable threshold. Charlotte developed an innovative 3-point strategy to try to improve performance. A ‘mask’ was developed to overlay the laboratory request form and help staff complete it more accurately. The key areas that must be completed to enable the laboratory to accept the request form, process the sample and release a result, all appear in the cut-out areas of the mask. All data fields visible when the mask is applied have to be complete for the laboratory to process the request. A new protocol helped phlebotomists identify where forms were incomplete or inaccurate. The screening laboratory rigorously reported incomplete and inaccurate forms to the trust. 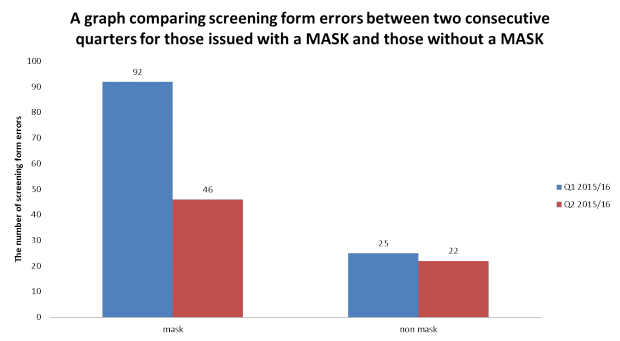 Staff using the mask saw better completion rates compared to those who did not use the mask. Overall, the trust’s KPI performance improved from 94.8% to 97.3% in just 6 months. At this point not every midwife (only 54 of the 86 community midwives) had a mask as they were still testing out the strategy. The trust has recently updated the laboratory request forms and new masks need to be developed. Once this has happened, they can be be issued to all staff and the team hopes it will see further improvement. Are you in a similar position with busy staff trying to complete many request forms? Can you hear the familiar cry of staff sighing ‘oh no not another form’? Could a simple strategy like this one help improve the quality of your screening programme? What’s new and coming up with NHS Newborn and Infant Physical Examination e-Learning?